We gathered frequently asked questions from customers. 120cm～4L　We have prescription glasses. Any easily changeable clothes are fine. Like casual wear, gym clothes. Please bring beach sandals for shower and changing clothes. ＊You will wear marine boots for the tours but we recommend you to bring beach sandals to use during shower. ＊For female guests, we wouldn’t recommend short pants or skirts or T-shirts on your swimwear because you feel stiff. After finishing the tour, you take shower and change clothes. ＊You also can change clothes at our shop. ・Person older than 60 without a medical certification. ・Person who has heart disease, diabetes, high blood pressure and the nose and ears disease. ・Person who is hung over or still drunk. ・If you don’t accept our instruction, we may refuse your entry even amid tours. I want to wear glasses inside a mask because my eyesight is poor. You can’t wear glasses but we have prescription masks. Please let us know if you need them. Can I wear contact lenses when I join the tour? Yes, we recommend you to wear contact lenses. Please a spare one just in case. Please feel easy. You wear wet suit and a lifejacket so you don’t sink. Our instructors take a big float which you can hold on if you can’t swim very well. You can join our tour even you are having your period. Please prepare a tampon. If you feel sick, please let us know. In case of rough sea, Blue cave entry is prohibited. In that case, you can snorkel in Maeda beach nearby. If Maeda beach is dangerous too, the tour will be canceled. Can I take air flight after diving? No. Diving training agencies recommend you to wait at least 24 hours. If not there is a high chance of getting decompression sickness which is very dangerous to your health. How deep do I dive? 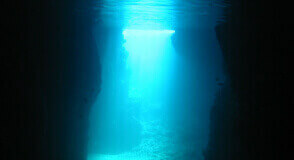 The maximum diving depth for first timers is 12meters. Near Blue cave, it is about 8 meters. 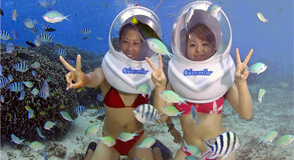 Even you can’t swim, you can enjoy our diving tour. Our instructors guide courteously so you can join our tour at ease. What is the difference between snorkel and diving? 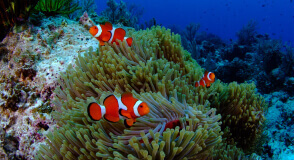 Snorkel is a marine activity you float on the surface of water. You breathe with “Snorkel” which enables you breathe with your face in the water. You don’t need an air tank so even 6 years old kids can enjoy it. When it comes to diving, you need a air tank on your back. 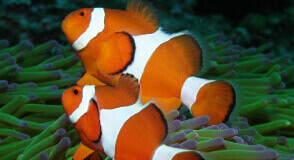 You dive into water so you can see corals and fish closely. We have prescription glasses. We recommend you to bring your contact lenses in case our prescription glasses don’t suit you. It is better if your contact lenses are disposable.